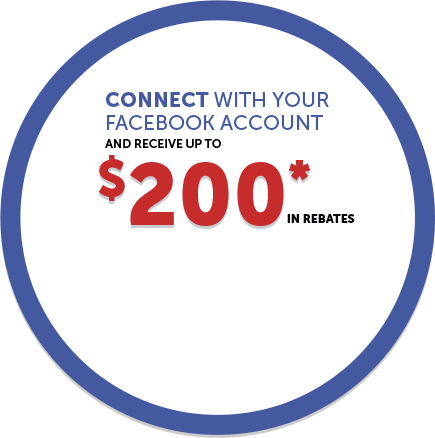 The Honda Civic Coupe is still on top of every driving enthusiast’s list when comes to time to shop for a performance oriented, reliable car. This year, Canada’s favorite coupe receives many upgrades like new design elements inside and out, new technologies and new commodities. The 2019 Civic Coupe is available in LX, Sport and Touring trims. The 2019 Honda Civic Coupe benefits from a few upgrades this year. In the front, the lower bumper has been restyled and the headlights have been blacked out. The grill gets a new gloss black colour treatment. Those who opt for the Touring trim will get upgraded LED headlights that offer even better visibility on the road. Finally, a new colour is on the menu: Tonic Yellow Pearl. The new Sport trim gets fog lights with gloss black trim, bigger wheels (18 inches), a black-painted decklid spoiler, Sport badging and a sport muffler with centre-mounted chrome exhaust finisher and one-touch power moonroof. 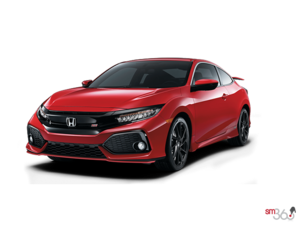 Under the hood, the 2019 Honda Civic Coupe offers a choice of two powerplants, the 2.0L DOHC multi-point injected 4-cylinder i-VTEC with 158 horsepower and 139 lb-ft of torque on the LX and Sport trims, while the Touring variant gets the 1.5L DOHC direct-injected turbocharged 4-cylinder that outputs 174 horsepower and 162 lb-ft of torque. That 1.5 L on the Touring variant may only be paired with a seamless continuously variable transmission, while the 2.0 L engine maybe be paired with either a 6-Speed manual gearbox or the continuously variable transmission. Inside, Honda Sensing technology is offered standard on all trims with a new Display Audio system. This system received an updated interface that includes a volume knob and physical buttons and an improved Bluetooth integration process. The steering wheel also gets new, redesigned controls. Engineers added insulation in the floor, trunk, and front fenders and in the rear fenders. The new Sport trims get sporty red gauges, a leather-wrapped steering wheel and leather-wrapped shifter along with aluminum sport pedals. 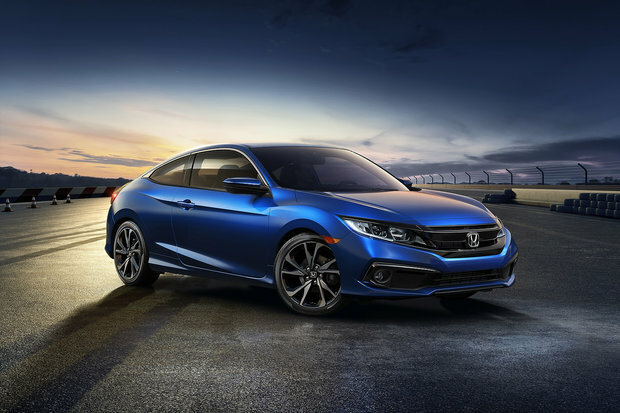 The 2019 Honda Civic Coupe is better than ever, with more character, technology and looks. 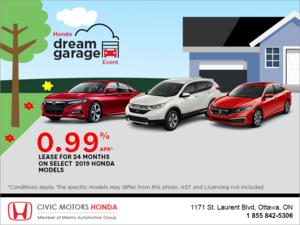 Come and see it at Civic Motors in Ottawa today!